﻿ KOREA OPEN 2009 SF – Ha-PI Days are Here Again! KOREA OPEN 2009 SF – Ha-PI Days are Here Again! For Pi Hongyan (pictured) of France, 2009 has started in the best way as the world #7 followed up her semi-final appearance in Malaysia by making her first final in over a year. Her less fortunate opponent, Zhou Mi, is one of four players who had won a Korea Open title while playing for China’s national squad but who came up short today. Pi Hongyan was on fire today in her semi-final against Zhou Mi. Pi was a two-time semi-finalist at the Korea Open while Zhou Mi is a two-time champion but today it definitely seemed that the tables had turned. The French player seemed so light on her feet as she glided about the court and executed her shots with precision. Pi made a crucial comeback in the first game, where she was trailing 13-18 but dug deep and pulled the game out 23-21. Zhou led throughout the second game but Pi was the one who still had some left in the third and she came away the 23-21, 19-21, 21-12 winner. Pi’s opponent will be last week’s winner, Tine Rasmussen (pictured) of Denmark, who had a comparatively easy 21-10, 21-11 win over Hong Kong’s Wang Chen that took only 19 minutes. “I feel so happy to be in the final again after going all the way last week,” said Tine. “I feel like I am at my old level again. It’s been a hard season but I think I’ve done the right preparation. There have been some small injuries but nothing to worry about. I think it’s a good sign that I can win one tournament and then go on to do well in the next one." The women’s singles provided more thrills, certainly, than the men’s event. Simon Santoso fell ill on Friday night and announced his withdrawal from the semi-finals on Saturday, giving Peter Gade a free pass to the final. 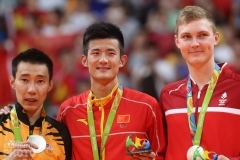 There, he will face Malaysia’s formidable Lee Chong Wei, who had little trouble beating the Dane in their two matches in last month’s Super Series Masters Finals in Kota Kinabalu, though things were closer last week in Kuala Lumpur. This time, however, neither player will have home court advantage but Gade might just feel a little more at home. 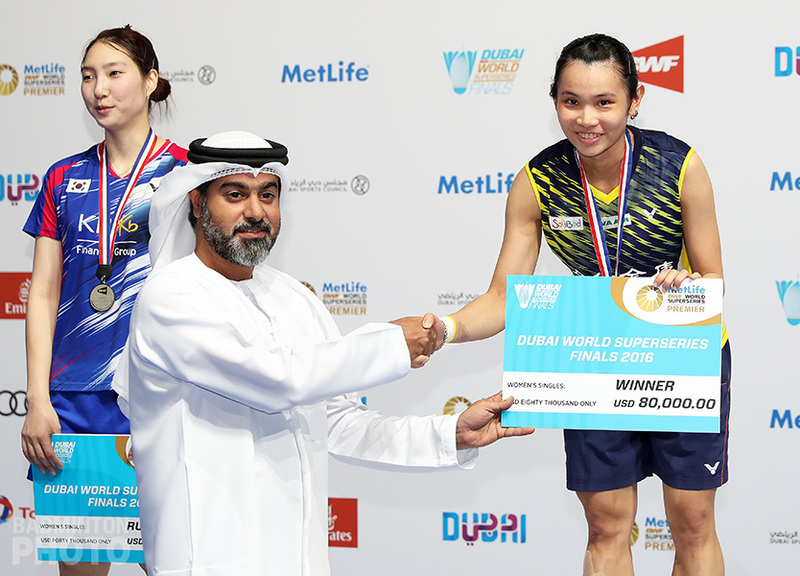 The three-time Korea Open champion has for some time been one of the few non-Korean household names among badminton enthusiasts here. Denmark has a chance at 3 golds on Sunday, in fact, as Boe/Mogensen dominated their semi-final against Chinese Taipei’s Fang/Lee. The Danish pair will attempt to prevent Korea’s Jung/Lee from taking their fifth title in 2 months. In fact, it was a win over Boe/Mogensen that gave the Koreans the first of those five. Two-time champions Yang Wei / Zhang Jiewen came up short for the second consecutive week as Lee Hyo Jung / Lee Kyung Won (pictured) looked stronger than ever. Lee Hyo Jung seemed to be using her height and strength to advantage more than in the past and rained down smashes on the former Olympic Champions. “I thought if I didn’t attack, we wouldn’t be able to win so I resolved to keep pounding away until the rallies ended,” said Lee Hyo Jung after the match. This strategy along with the Korean pair’s overall consistency worked wonderfully in the first game but they found themselves trailing in the second as the Chinese led throughout. Lee/Lee had a perfect chance to tie the second game when, at 11-12, Lee Hyo Jung had a perfect kill opportunity but swung too early and mishit the shuttle, giving the advantage to the Chinese, who took the attack and sent each of the Korean ladies sprawling to the floor in succession. 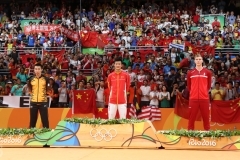 This set off a 7-point run by the Chinese from which the Koreans never recovered and they ceded the second game 18-21. The third game belonged to the home pair and they qualified for their second straight final with a 21-16, 18-21, 21-10 victory. “Before we played in Malaysia, we were a little nervous with Lee Kyung Won coming back from injury,” Lee Hyo Jung explained. “I told her to take it easy, that we needed to make sure she didn’t get injured again.” Hyo Jung explained that she hopes to continue to partner Lee Kyung Won until the London Olympics. Still, the task at hand is on Sunday afternoon, when the Koreans will be going after their second Korea Open title but, ironically, playing in their first final together. The last time they won their home event, in 2005, they had a walkover in the final when Emms/Kellog were force to withdraw. Gao Ling, herself a 3-time winner in Korea, was beaten by the top seeds in what paradoxically seemed like an upset. Chinese Taipei’s Cheng Wen Hsing / Chien Yu Chin (pictured above) won in two games over Gao/Wei 21-15, 21-17. Songphon Anugritayawon / Kunchala Voravichitchaikul (pictured) of Thailand have made great strides this year and finally have ended up in their first ever final in any major tournament. They enjoyed the narrowest of two-game victories when they beat India’s Diju V / Jwala Gutta 21-19, 22-20. The Thais saved two game points in the second game before jumping ahead to secure the win. 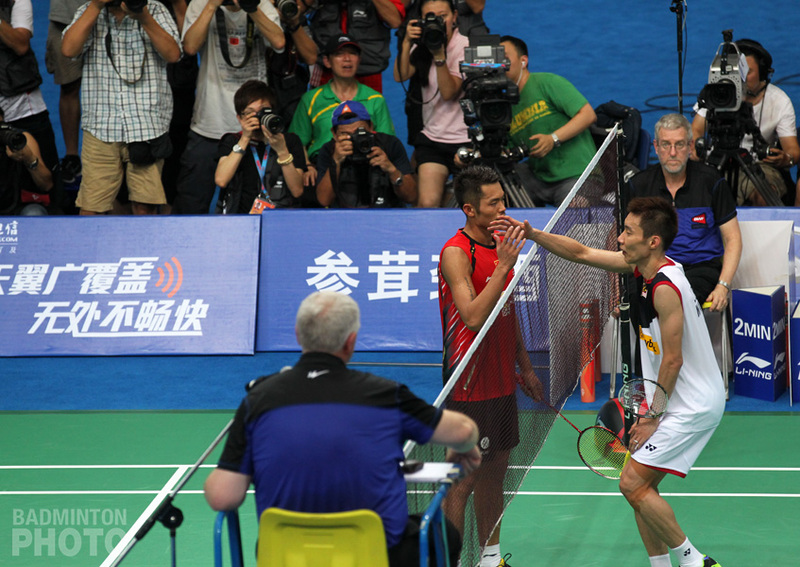 The Thais have the unenviable task of taking on the Olympic champions Lee Yong Dae / Lee Hyo Jung in the final. Hong Kong’s Chau/Wiratama stayed closed throughout most of the first game but finally Lee/Lee pulled ahead and never looked back in the second as they roared to a 21-16, 21-11 win. They’ll have more than just the prowess of the world’s #2 pair to contend with. Lee/Lee’s professional team, Samsung, typically brings in busloads of boisterous supporters to augment a cheering section that, this year, will no doubt be dominated by legions of young girls swooning over Lee Yong Dae. Lee Hyo Jung said after her semi-final that Olympic success has made life significantly different. 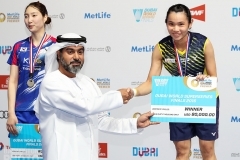 Though she hopes that the attention now focussed on Lee Yong Dae will turn into interest in all of the players and in the sport of badminton itself, she is clearly already sharing that limelight to some extent. “These days, even when I go to a public bathhouse, people recognize me and suddenly people will buy me soft drinks,” Lee admitted. The No. 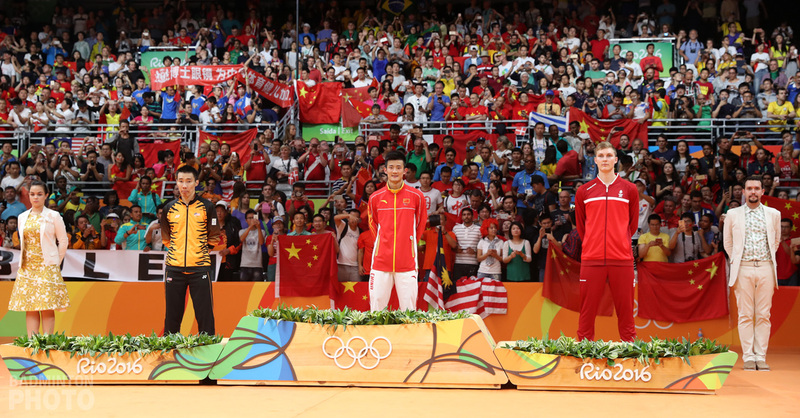 2 Olympic Gymnasium has been patrolled this weekend by giant likenesses of both the Beijing gold medallists and the two original icons will no doubt be doing their best in the final to justify the attention.